Not many people felt the Dolphins would do much in the 2012 season, but as they enter a week nine showdown with Andrew Luck and the Colts, the Fins find themselves as one of the hotter teams in the AFC. With rookie QB Ryan Tannehill leading the way and a young defense playing well, the Fins walk into Sunday’s 1pm affair currently as the fifth seed in the wide open AFC. Tannehill went down last week in a win over the Jets, but a bruised left knee and quadriceps muscle didn’t sit him long, as Wednesday in practice he split with veteran backup Matt Moore. Moore went 11 of 19 for 131 yards in New York as the Dolphins won their third-straight under rookie coach Joe Philbin. They haven’t won four straight since 2008. One of the league’s more experienced backups, Moore threw 16 TDs and nine interceptions with an 87.1 rating in 13 games last year. Miami has been outgained in each game during its winning streak, including a jarring 825-428 disparity in the last two. A running game that ranks 11th in the league (115.9 yards per game) has all but disappeared, averaging 71.8 over the last four. Bush hasn’t run for 60 yards or more since Sept. 30. As for the Colts, 2012 has already been a solid year as well with Luck leading the way as a possible choice of AFC Rookie of the Year. The Colts have already doubled their 2011 win total, and Luck has won one more game than Peyton Manning did as a rookie. They’re 3-1 since offensive coordinator Bruce Arians took over for the ailing Chuck Pagano. “We got four more wins than everyone thought we would have, so that’s good,” linebacker Pat Angerer said. Luck has thrown eight TDs and eight interceptions, posting a passer rating of 74.6 while his 281.6 passing yards per game rank ninth in the league. Indianapolis has 13 first- or second-year players on the roster, and Luck along with running back Vick Ballard and receiver T.Y. Hilton are three of the rookies providing the biggest impact. Indianapolis is 24th in scoring (19.4 ppg) despite ranking eighth in total offense (373.0 ypg). That inefficiency is largely due to 13 turnovers and the offense only scoring touchdowns on 45.8 percent of its red-zone possessions – 24th in the NFL. Luck will be without one of his red-zone targets on Sunday, as rookie tight end Coby Fleener won’t play after suffering a shoulder injury against the Titans. The Colts will also be missing a member of their secondary with whom the Dolphins are familiar. Miami dealt cornerback Vontae Davis to Indianapolis for two draft picks late in the preseason, but Davis won’t face his former team due to a knee injury. This will be a fun game with two young QB’s going at it tooth and nail. 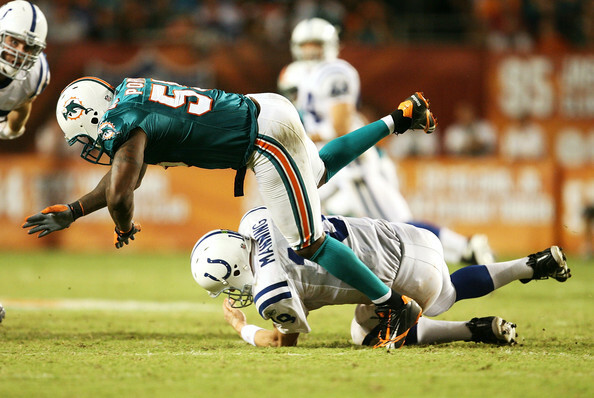 While the Fins have played well, I like the home team and Luck, and think luck will be on the side of the Colts Sunday. Who Wins the Dolphins at Colts Week 9 Battle?